Well, not everything I post will be ultra modern. Sometimes I think a well made 18th century furniture can be strategically tied in with a modern interior to create an interesting dialogue. The Badminton Bed, while not for sale, is one such object. 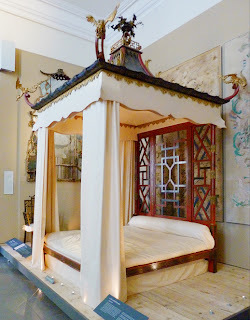 This bed has been exhibited at Victoria & Albert Museum in London since 1921. It was commissioned by the 4th Duke of Beaufort’s wife in 1754. At that time, Chinoiserie was all the rage in Europe. It didn't matter if the style was Japanese or Chinese. It was all lumped together and called Chinoiserie. The Duchess had the great cabinet maker John Linnell designed and made the bed for her as well as mirrors and chairs. The bed looks like it was made of lacquered but in reality, the technique used is called Japanned (which is basically pigmented varnished that was build up). I like the bed for its whimsical element. The dragons at the tip of the canopy are just so much fun. I'm sure John Linnell must had a blast designing this bed.....it's almost like people in the 1950s designing futuristic furniture; you just let your imagination go wild.